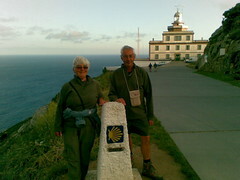 Congratulations to Tracy (left) and Adrian (right) both from Singapore who had completed their Camino de Santiago in April 2008. 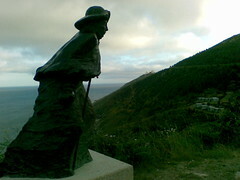 This route is getting popular, but is still in no way as popular as the Camino Frances. 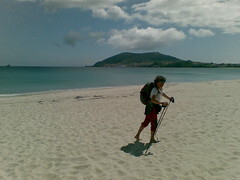 At the same time, it is not as remote as the Camino Primitivo. 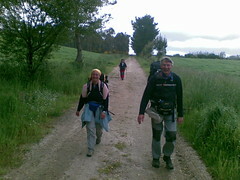 Most of the pilgrims on Via de la Plata had walked at least 1 camino previously. Many may prefer to walk alone, but almost all of them will welcome the company at the end of the day. I was never really alone. In almost every albergue, I manage to find 2 beds for myself. The top bunk for my stuff and the bottom to sleep. 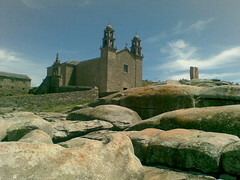 With the exception of Aldeanueva del Camino where I did not have a bed and had to stay at a hostal. There are only 8 beds and 2 mattresses there and I was unlucky that there was group of 6 Spanish pilgrims who happens to stop there earlier in the day. Beds in general is a non issue. I was unlucky that there was 4 albergues early in Extremadura that was closed for the year (suspected that it was due some dispute between the people who run the albergues and pilgrim's association). Had to stay in hostal for some of them as there are not way around it. On the other hand, there are now albergue for Salamanca and Zamora (new this year) that was pleasant surprise. In all, the infrastructure is now getting better. Best to budget for a couple of days of stay at a hostal at around 15-20 euro per night. Generally good with the exception of a few cities with markers into the city but not out of the city. Have to rely on the information from the guide book for these exceptions. 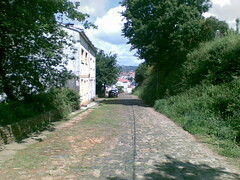 Only 1 steep climb in Andalucia, otherwise it is pretty much flat or rolling hills all the way past Zamora. 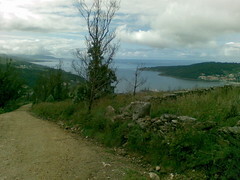 However, the steep climb to Galicia and the following few days after I think is more challenging than the Camino Frances. That can be minimize if one chooses to walk and additional 35 km via Verin which is flatter than to go straight to Laza via the mountains. It is tough to plan for a daily under 30 km day. Example, either you do a 36 km day (or 15 km and 21 km in 2 days). That would mean more days if one afford it. 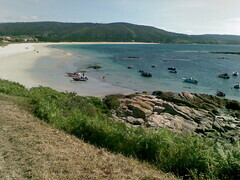 If you don't mind staying at private albergue, then there is only 1 long stretch of 38 km. Else there may be around 3 long stretches to tackle. Even on these long stretches, you can still do it in 2 days if you don't mind staying at a hostal (with around 2 km detour to and from the hostal). 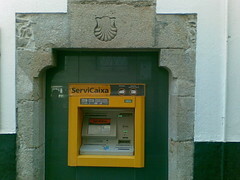 Dispenses money or claim shells? At just under 11 minutes, this is a long video (montage of images) of my Camino Via de la Plata spanning 39 days (normally around 35-40 days). I was pleasantly surprised when YouTube accepted the video, as they normally would not take in any video that is more than 10 minutes long. Choosing the music for the video had been tough. In the end I've decided on a flamenco piece (Al Di Meola - Flamenco Classical) followed by another medieval number (Dead Can Dance - Saltarello). 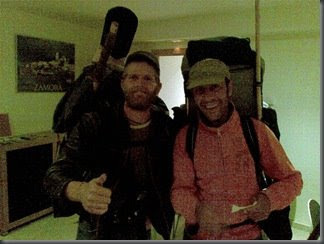 In Zamora, I opened the door in the albergue to let Sébastien (from Belgium - left) and Joseba (from Basque - right) around 10 pm so they can crash for the night in the this new albergue's huge kitchen area. It had started to rain, and they told me that another pilgrim in the albergue had told them that they are too late and refused to open the door for them. 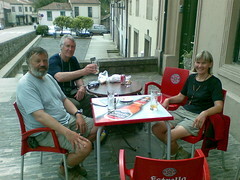 Sébastien and Joseba had just walked their Camino Frances. 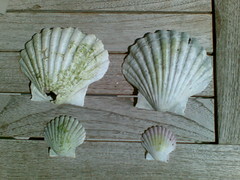 They decided to continue their journey south, sometimes via hitchhiking. 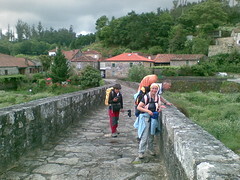 They had started their own blog to record their journey, beginning from Santiago. I was just given the link to their blog and was surprise to see myself in one of their videos. I appeared for a few seconds on the second video, taken right after I have led them to the dining/kitchen area. I wish them a great journey. Before I get around to compiling a video montage for my Camino Via de la Plata, here's a short one from the 3 days walk from Santiago to Finisterre, bus to Muxia and back to Compostela again. The music is from 'Dead Can Dance' titled 'The Arrival and the Reunion'. 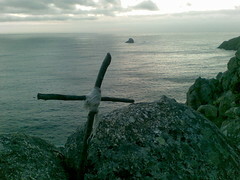 I find this track very appropriate as it is exactly what this is, a reunion of pilgrims from our Camino in 2006, each of us coming from different directions. 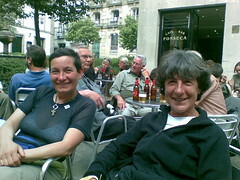 For Mike, Rosalinda, Cinzia, Béné (who is not able to make it), and all other pilgrims I've met on my Camino Frances in 2006. 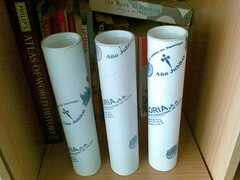 Another compostela (in the tube). Lazy to frame it up. 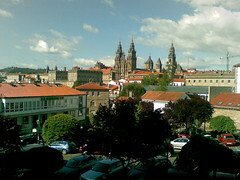 The real compostela is in the head. 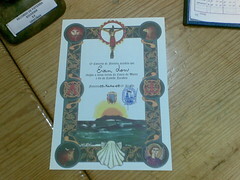 Now I need at least a 8 mins long music to compile my video of the Camino via de la Plata. Still a long way from home. No more cafe con leche, cortado, solo. 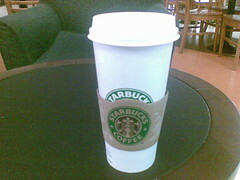 Only this watered down version. Before my overnight bus to Madrid to catch my flight home. 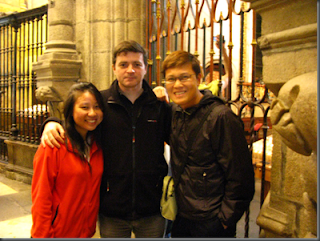 Took a bus back from Muxia to Compostela this morning with Mike, Cinzia and Rosalinda. 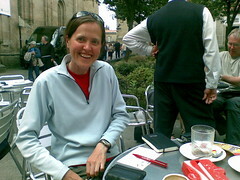 I will be leaving tonight on the overnight bus to Madrid and will fly back from Madrid just after noon on Monday. This is the video from today's mass at noon in Santiago de Compostela with swinging of the Botafumeiro, an awesome sight. 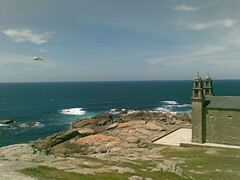 This is a great place to stop after Finisterre. around 3 km behind on the right. I am staying an extra day here. Lucky to be able to find 2 big ones. 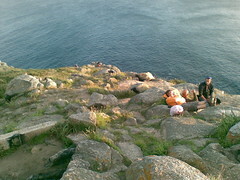 pilgrims are doing the same thing along the beach. This is my spot. There is no more roads to walk. My journey has ended. as this the last stop for most of them. 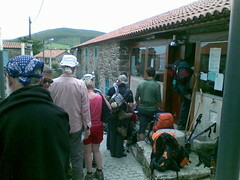 The rush for beds in the albergue was incredible. It has become like a race. 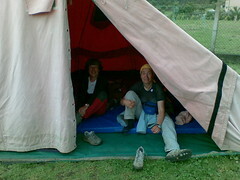 previous day in the tent. day. 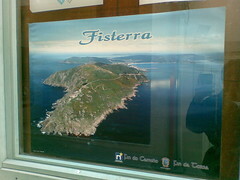 3 days to Finisterre. Rosalinda and Cinzia. 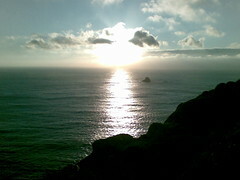 She will be joining us to Finisterre. 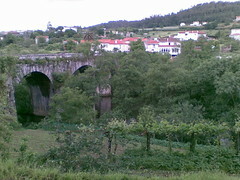 Portuguese. She will be going home the next day though. Hey Jimmy I am back! 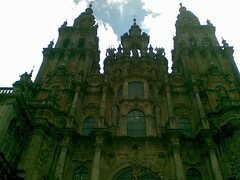 Over 1000 km on the road, finally at the cathedral. There is always time for one more drink! from via de la Plata looks nicer than from Camino Frances from the east. 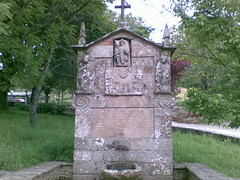 A water point for St. James just before the albergue. One more day to go. 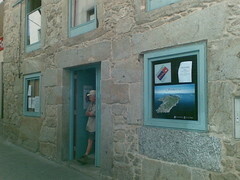 albergue. That's means only 16 km on the last day.